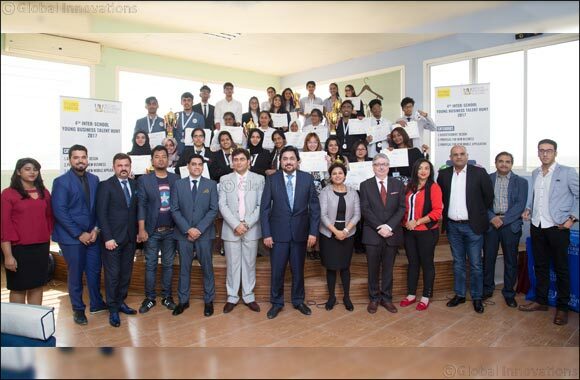 Dubai, UAE, October 21, 2017: The 4th Inter-School Young Business Talent Hunt 2017 (YBTH) organized by Skyline University College and The Young Vision magazine has received an overwhelming participation of 40 schools from across the UAE during the 3-day event from October 16-18, 2017 at SUC campus. A total number of 247 teams are competing in three categories of Advertisement Design, New Business Plan, and New Mobile Application. The Chief Guest of the event was SUC Founder President, Mr. Kamal Puri, who delivered a motivational speech to inspire and encourage the young generation. Farzeen Amin, Razan Mutasim, Rashida Puras, Elisha Francesca Santos Salamanca of Westminster School Dubai garnered the winning spot for Advertising Design; Karthika Vijay, Vanshika Bhardwaj, Fathima Fidah Faisel, Sivani Suresh Kumar of Gems Our Indian School Dubai was the champion for New Business Plan; and finally Praniti Mirani and Paula Castillero of Dubai International Academy won the New Mobile Application category. In line with SUC’s main focus this year to promote entrepreneurship and innovation among students, winners of the competition will have access to the Skyline Entrepreneurship and Innovation Centre (SEIC) seed fund amounting to 50,000-100,000 AED provided by SUC to every potential business plan. The fund aims to encourage more young entrepreneurs to pursue and develop their business ideas. Thus, YBTH 2017 is the right platform for students to present their business plans and meet potential investors. In addition, winners will have the opportunity to present their business plans and ideas to venture capitalists in the UAE. YBTH 2017 winners have also won undergraduate scholarship program at SUC and gift vouchers along with trophies. The success of the competition would not be possible without the participation of the esteemed line of external judges who have shared their expertise to the young talents.